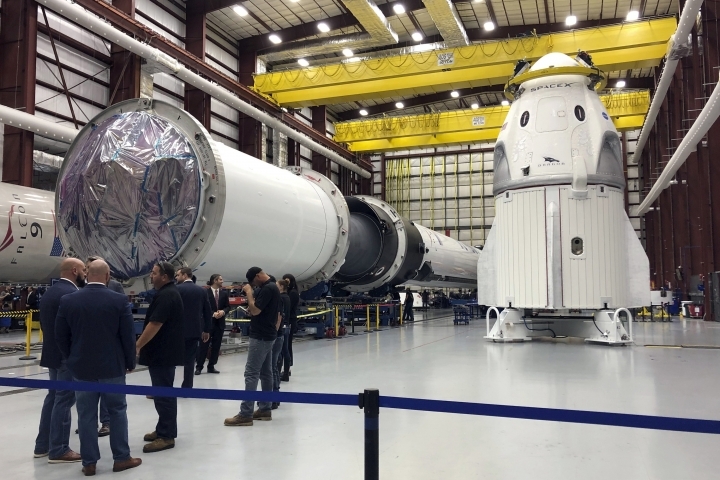 CAPE CANAVERAL, Fla. — NASA and SpaceX are now aiming for a March debut of the first capsule from a private company designed to fly astronauts to the International Space Station. No one will be on board for the crew Dragon's inaugural test flight to the orbiting outpost. Officials on Wednesday set March 2 as the latest launch date. If the demo goes well, two NASA astronauts will take a test flight in July aboard the SpaceX capsule. It would be the first launch of U.S. astronauts into orbit, from U.S. soil, since NASA's shuttle program ended in 2011. President Donald Trump mentioned the upcoming milestone in Tuesday night's State of the Union address. Boeing, meanwhile, is shooting for an April launch of its first Starliner capsule without a crew. The first Starliner flight with astronauts would be August at best. NASA's commercial crew program has been delayed repeatedly over the years, forcing a lengthy, expensive reliance on Russian rockets. Each seat on a Russian Soyuz capsule has cost NASA as much as $82 million. More time is still needed to complete testing, training and safety reviews, according to NASA. Kathy Lueders, manager of NASA's commercial crew program, said the initial launches without astronauts are "a great dry run for not only our hardware, but for our team to get ready for our crewed flight tests." NASA is paying SpaceX and Boeing to provide the capsules and fly astronauts to and from the space station, allowing the space agency to focus on developing a new capsule, Orion, and rocket, Space Launch System or SLS, for transporting astronauts to the moon and, eventually, Mars. SpaceX has been delivering cargo to the space station since 2012, under contract to NASA. Northrop Grumman is NASA's other station supplier. Blue Origin is also developing a crew capsule that might carry passengers by year's end. But that capsule is intended for brief up-and-down hops, not orbital flights, by tourists. Virgin Galactic also is preparing a spaceship for tourists. Wednesday's announcement fell on the one-year anniversary of SpaceX's debut of its Falcon Heavy rocket, which shot chief executive Elon Musk's red Tesla convertible into space with a mannequin, dubbed Starman, at the wheel.